Reference : VG-H 119-1 variety. Size : 27.8 x 28.5 mm. Weight : 2.90 grams. Grade : VF with a flan crack. Obverse : Crowned arms of Austria-Burgundy, with PhS DEI GRA ARChID AVSTRE DVX BVRG B Z around. 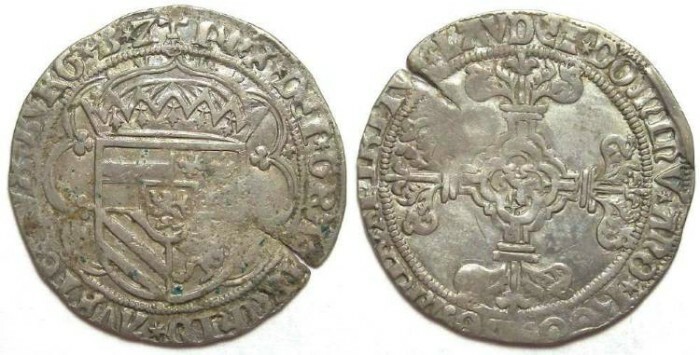 Reverse : Cross fleuronne with a lion mint mark in the middle, with DOMNIS SPIBITVS LAVDET DOMINV ANO 1500 around (the letters are all there, but some are difficult to read). Please note that the image of the reverse is upside down, so the date is at the bottom right, rather than top left.